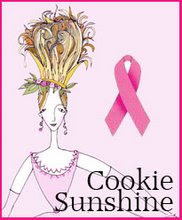 Today, Halloween, is the last day to enter the Cookie Sunshine contest where the prize is a hand signed 8 x 10 matted and framed copy of her original illustration and rhyme (seen on the left) appropriately named "Princess Pink". Click on the pic for details. The second pink box is for breast cancer research: you can click it daily and sponsors will financially support research based on the number of clicks. It's totally free and only takes a second. Thanks for your support. Credit..mortgage..crisis. Okay, I said the words and that's all I'll say. I know we are all tired of hearing those words. The price of gas is down and who ever thought we'd say "whew! A gallon of gas is below $3, thank goodness!" It's more intense than Sept. 11th since this is touching me directly. 2 family members lost jobs over it and another has to delay retirement plans since they were based on building a realty business. It's interesting that a new cupcake shop that opened recently claims a booming business as customers grab for anything that makes them feel oh, so good. Well, that's my goal today, to distract you with some fantasy and a little art. Get away from it all and just enjoy fun & beauty. First up are 2 of 3 stickers I punched this week using an official Disney punch set I found. 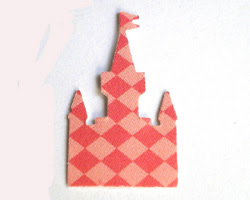 Nice big shapes: a castle, a Cinderella slipper and a little crown. You can see a big 75 piece set at www.MomsArt.etsy.com. 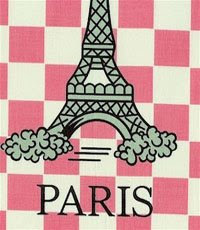 I used my favorite set of pink, black & white papers I like to call "Paris". 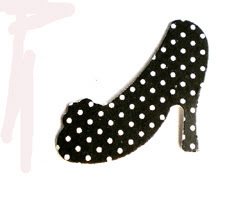 You'll find harlequin, polka dot, plaid & solid patterns to make you smile. 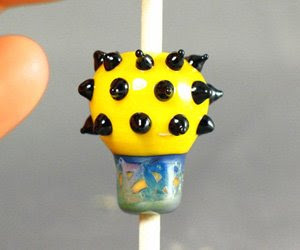 Next up are my renderings of a custom request for a lampwork glass hot air balloon. 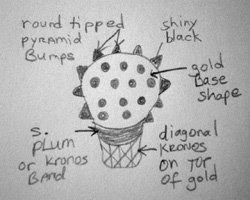 Payton Jett asked me to draw my fantasy balloon to use as a pattern when working with her glass. 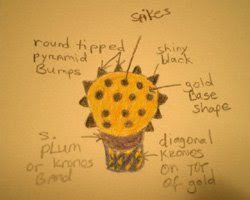 We discussed color and style since getting the black points to NOT run into the yellow balloon was the biggest challenge. I love that Payton likes to challenge herself with new ideas. I have displayed for you the black & white drawing that I then colored for her...followed by the finished product. How awesome is that??? I mean, she got it right...spot on! And this is just for me to wear...but if you'd like one, let me know and we can get the ball rolling for you. If you can dream it, it will come! Come see the Jack Skellington Payton designed that I turned into a necklace at www.RockerJewlz.etsy.com. I still have plenty of pumpkin/holiday jewelry left as well. I hope you enjoyed this foray into my little fantasy world. Now I'm off to enjoy the most amazing autumn weather we have ever had here in the S.F. bay area. It's like the summer we didn't get this year: warm sunshine with cool breezes. Yum! Airplanes & godson & boats, oh my! Fleet Week in San Francisco was a great experience. I rode the metro into the city with family and just love riding the escalator up onto street level. It's fun to see the building architecture from that angle. We walked to the Ferry Building...that is its tower in the first photo...where a wonderful farmer's market is located and waited for the "F" line bus to take us to a north bay spot to view the air show. That big tower clock chimed 12 times for noon...very cool. Some of the buses are really old, like maybe from the 30's. Very retro and painted in just about any color you can imagine. Luckily, though, we caught a bigger, modern bus which accommodated my godson's stroller. picnic lunch we carried with us. I spied a possible viewing area off to our right, but me and Sis realized it was covered at the end and would hinder our view...and just then, a lovely lanky woman walking her dog entered a short dock which, from our perspective, had looked closed. We dashed over to it and saw the sign: "authorized berth owners only". Sis said, hey, we have a berth, just not in San Francisco...let's go!" We were the only people there and it was suddenly very quiet although we could look across these cute little boats and see all the street traffic. We were so happy as we pulled out our fresh rolls, salami, cheese, olives, cherry tomatoes and grapes. Dad dashed off to grab a couple of beers and a cigar. say "wow". Virgin America debuted their first flyby of their new commercial liner, an Airbus A320 that flew back and forth and maneuvered rather quickly, not what you'd expect from a big jet. The Blue Angels flight team is what we really were there for. They always finish the show. We were totally surprised first with a Blue Angels C-130...a gigantic plane that is large enough to haul a few military tanks. It was painted blue with gold like the fighter jets but it moved in completely unexpected ways! I've seen C-130's fly before and they are so huge they appear very cumbersome and slow...but this guy was awesome...he flew quite quickly and even vertically! None of us had ever seen that before. It was so agile in its moves we were in awe. Then, of course, it was time to be the "winner" that spotted the fighters first. They move so fast that you only have a second or two to hear them before you see them. They flew in differently than in the past...bro in law spotted them from way far off so they weren't a surprise this time. I just kept putting my camera up to the sky and clicking having no idea if I even had them in my sight, but this photo turned out pretty darned good, I think. During our lunch, a boat owner walked past us and we asked if we'd get in trouble or cited for being on this dock. He said, "oh, no, you might be asked to leave if too many additional people enter, though, because basically, this dock is condemned and could crumble under too much weight". Sheesh! Okay. All was well until more viewers entered "our" dock. Several people brought with them freshly fried lunches and suddenly we were inundated with seagulls wanting to partake. Yeah, they had no interest when we had our fresh lunch I mentioned earlier...they wanted the fried food! One even flew right up to a woman's french fries and stole one right in front of her...funny. My godson's favorite part of the day, I think, were those seagulls. And guess what...we did feel the dock sway a bit at one point with all those people on it...a little scary. As we walked back toward the metro, we passed Houston's restaurant and Dad treated us to a yummy dinner. We reached the metro as darkness fell and waited only a few minutes for the train home. All in all a great day with smooth traveling and perfect weather. My only jewelry news is that all Halloween & pumpkin purchases will be shipped within 24 hours so that you have it in plenty of time to enjoy it. Visit me at RockerJewlz.Etsy.com. A couple of entries ago I promised to talk about Paris and Stoned Birds. My dad attempted to find a home exchange situation so that we could visit Paris for a few weeks in trade for his place in California. A couple of people responded but no deals ever came through. Now, who knows why it didn't happen. It was such a great idea as it would mean we'd only have to scrounge up airfare and fun money. I don't even count food allowance 'cuz we gotta eat no matter where we are! always hope and as someone said in a movie, "there's always Paris!". I'm just hooked on Payton Jett's glass work talent. I mention her in every blog but it's because she keeps life fresh by accepting new challenges. 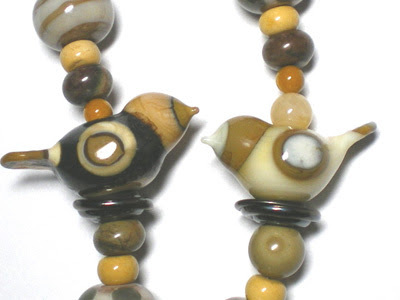 I nabbed several of her glass birds recently and 3 of them ended up in my Stoned Birds necklace, thusly named due to only stones being used in this piece...no other materials. Originally I had a sterling clasp, but then decided to use either glass or stone for the clasp, so it awaits that final component before I list it in my Etsy shop. 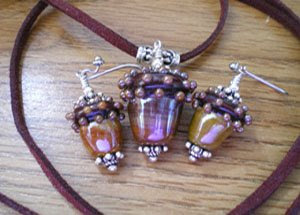 Another awesome group of lampwork glass beads is this acorn set from Cassie Donlen. I just had to hold these beauties for a while before I could let them go. silver to reflect the bead bumps. This photo captures their awesome shiny iridescent quality. The colors are chocolate and caramel, but when you get them in brighter light, you discover the faint plum iridescence in the chocolate and the hint of gold in the caramel. design this week, the Royal Opera Necklace. 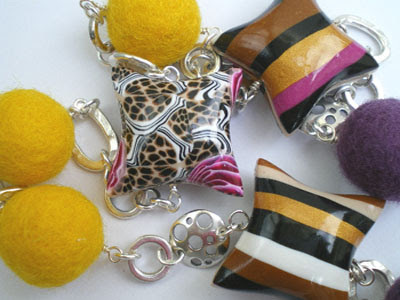 I've been dying to work with these handcrafted felt balls I got on Etsy and Sigaliot's polymer squares from Israel. The colors and designs are so yummy. I connected them all with various sizes of round and oval sterling silver rings, some smooth, and others oval. A big crescent moon from the Karen Hill Tribe is the focal point. Originally intended to be opera length, it didn't quite get there, but almost at 34 inches...enough so that even with a beehive hairdo, this easily slips over your head so there is no need for a clasp. Come on over to Etsy and see the complete necklace. Finishing up a wonderful week of vacation with my husband. We started with one goal and that was to visit his parents. We ended up seeing nearly the entire family which was a great surprise and celebrated several birthdays in one shot. On the spur of the moment, we headed over to my dad's since it was just a couple of hours away. It was wonderful to introduce my husband to our little secret spot at a country winery that leaves it's beautiful padded wrought iron chairs and tables outside after hours. Seated on a small hill overlooking hundreds of acres of vineyards and mountains, we took a warm dinner to munch while the sun was setting. A few cigars and drinks later, we began to count the stars one by one and await the new moon. Now THAT's a vacation and a great surprise to add to our travels. **UPDATE: October 16th: I listed "Stoned Birds" choker mentioned in the post above. You can view it by clicking Etsy.